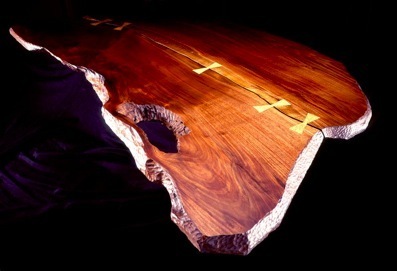 I like finding large and unusual hardwood slabs of walnut or cherry. People are always astounded by the natural beauty of trees and the individual shapes they grow into. This form became the top to a table at the Merrill Memorial Library here in Yarmouth. The table itself is very low to the floor and is used for the library’s daily newspapers. This one is walnut, from a tree grown here in Yarmouth. The walnut tree from which this table was constructed was planted by the founders of the town back in the late 1600’s.